Minnesota Vikings quarterback Brett Favre is now a first-time grandfather. 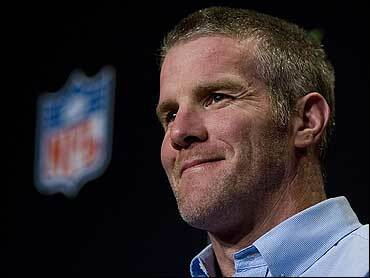 Favre confirmed on his Web site that his daughter, Brittany, gave birth to her first child, a boy named Parker Brett. "Deanna and I are very proud to welcome our grandchild Parker Brett to the Favre family," he wrote. "Parker Brett was born on Friday, April 2, weighing 7 lbs. 7 oz and we're pleased to say that both Mom, Dad and Parker Brett are healthy and doing great." If Farve returns to the Vikings for his 20th season of professional football, he'll be the first grandfather to actively play in the NFL. The three-time MVP turns 41 on Oct. 10.